Raymond Wills entered play work as a Community Service Volunteer in the early 1960s. Throughout his time in play work, he was an active member of numerous play bodies, Play Councils, regional play associations and national play campaign. In this article, he shares a detailed history of play in the UK. The history of play provision in the UK is short. It wasn’t until the early 20th century that it really began. Prior to then, there were few attempts to provide children with any leisure activities apart from those led by the MacMillan sisters and church groups. Charles Wicksteed built unsupervised playgrounds in his factory after watching children playing with some pipes left outside the gates of his factory, whilst the Danish architect Sorenson had a dream of children’s playgrounds which came to fruition with his Emdrupt junk playground in 1943. The National Playing Fields Association (NFPA), established under royal charter in 1926, was led by Drummond Abernethy and his team of retired military officers. By 1960, NPFA had established a play leadership department at their playfield house headquarters in London. 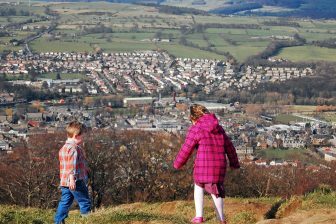 Until then the NPFA had in the main promoted over 700 recreational playing fields throughout the UK and set national play provision standards for unsupervised playgrounds in close proximity to housing. Lady Marjorie Allen, whilst on one of her UNICEF excursions, visited the Emdrupt junk playground shortly after the war. She was extremely impressed with what she saw there and returned to the UK leading a campaign to promote such sites in the UK. In the blitz and after, children were playing on the bombed sites of the cities creating their own playgrounds out of the rubble around them. There was great public concern during the war years as to their safety. Busy roads with heavy traffic and rising juvenile delinquency were concerns after the war. 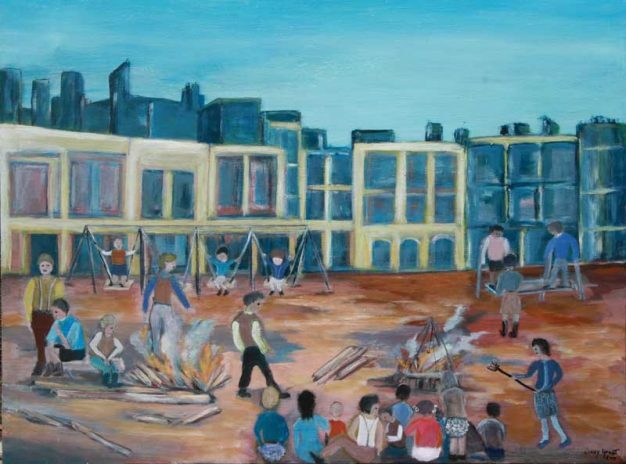 Marjorie, with the support of Drummond Abernethy and the NPFA, set up 17 trial junk playgrounds in the cities led by playworkers such as Harry Killick at Lollard Street adventure playground London. Following their success, others soon followed. Adventure playgrounds were places where children were able to do many things which they were not able to do elsewhere. They used tools to build dens out of waste materials and duckboards, lit fires, cooked, slid down aerial zip runways, created gardens, etc. These playgrounds were provided with free access, open to children of all ages most evenings, weekends, and during school holidays. These were established and managed by committees such as at Pat Smythe’s Notting Hill, London and Gene Pecks’ adventure playground at Sparkbrook in Birmingham. In the early days, most had just one paid full-time playworker whose role was as an enabler, friend, and supervisor. Initially, the leaders were called Wardens but soon gained the name Play Leader then finally, Playworker. The playgrounds category name had been changed from that of junk playgrounds to adventure playgrounds following meetings between Marjorie Allen, Drummond Abernethy and others. Until then, in the ’50s there were few schemes for children apart from games in the parks led by park wardens. Pat Turner set up adventure playgrounds in London and had great success with 1 o’clock clubs for mothers of infants in the London parks. Others like Joe Benjamin also had great success establishing successful adventure playgrounds. The growth of such schemes expanded throughout the 1960s with the success of Ed Burman’s InterAction in Camden, London. Venture schemes by the YMCA at London and Romford and local councils play leadership schemes during school holidays such as 12 at Redditch were also successful. There was a huge growth in the early ’70s of both adventure playgrounds and play schemes nationally managed by local community play association, local councils, development corporations and charities such as Barnardos. Many new bodies were formed to promote and encourage this provision, such as the Fair Play for children campaign led by the Rev Trevor Huddleston, Bishop of Stepney with the film Children Waiting. The Adventure Playground Workers Association and London Adventure Playground Association, etc. led by Mike Buckley, Jim Jackson and Pat Smythe were paramount in campaigning for adventure playground acceptance and standards. In the mid-seventies, the new towns, such as Donne Buck’s, Bandley Hill adventure playground at Stevenage led this campaign supported by Jack Lambert’s Welwyn Garden City with his Penguin Book’s Adventure Playgrounds. The NPFA now chose to abandon the military link appointing play workers as regional play officers nationally to promote and support community groups and local councils. A range of in-service training courses was established nationally for the training of play workers at colleges such as Stockport and Goldsmiths in London as well as an Institute of Playwork established with its own full-time diploma course managed by Colin Mayne. There were no concerns over the safety of children using the unsupervised playgrounds situated close to the housing with tragic stories of fatalities. A campaign was led by the NPFA, Donne Buck, and Rosemary Hamburger and others to provide safety surfaces for these playgrounds involving others like MP Raul Rose and TV celebrity Esther Rantzen. With the political restraints that followed during the Thatcher government years and the austerity measures introduced in recent years, a great many adventure playgrounds were shelved by local councils with restrictions on financial support or else with cuts in opening hours and staffing. All of this had a disastrous effect on play provision right across the board nationally plus many play bodies and organizations which had evolved like Play Board were no longer able to function. 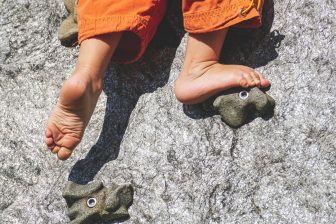 Despite these concerns and the restraints imposed by the new health and safety standards legislation, many adventure playgrounds are still operating successfully. Places like the Wrexham Land Adventure Playground have adopted new schemes. A few which started up in the adventure playground heyday, such as at East Dulwich Dog Kennel Hill, London, and Fernheath Play Center, Bournemouth, are still functioning as originally designed. Today, we can build new adventure playgrounds to share the benefits with the next generation. 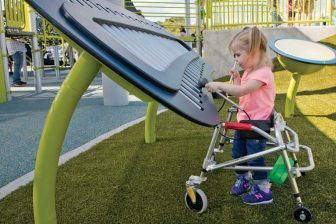 Article courtesy of Playground Professionals (PGP). Ray entered play work as a Community Service Volunteer in the early 1960s as a play scheme leader at Romford YMCA then at Redditch District Council. 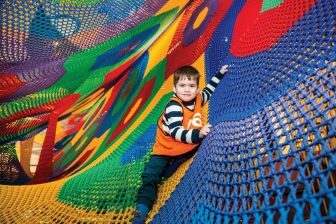 He set up Adventure playgrounds, play centres and town-wide play programmes throughout the UK for over three decades. Throughout his time in playwork, Ray was an active founder member of numerous play bodies, Play Councils, regional play associations and national play campaign.